I love this meal – besides the fact that it’s ridiculously delicious, is a “5-ingredient meal” and is freezer friendly…it takes like 5 minutes to prepare. Actually, more like 3 minutes. Place ravioli in dish. Add water to dish. Pour sauce over the top. Sprinkle Parm. Sprinkle mozz. BAKE. 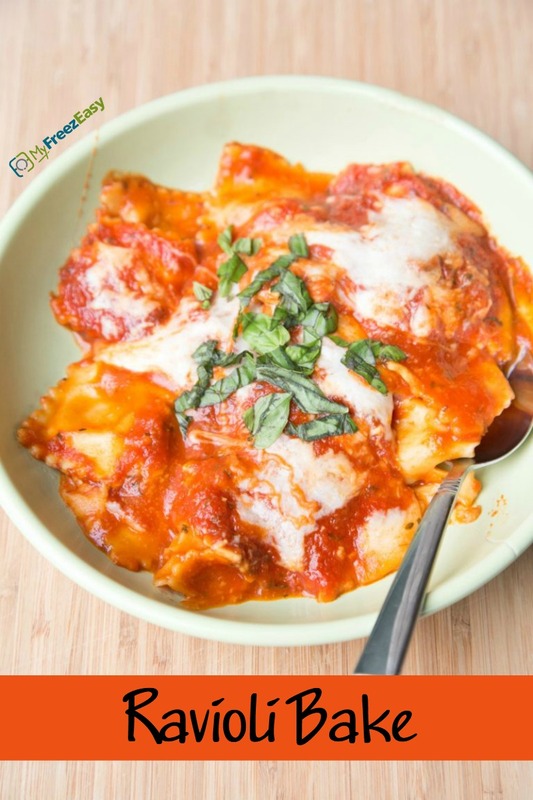 Place the ravioli into the base of the baking dish and pour 1 cup of hot water over the top. Then pour the spaghetti sauce over the top and then sprinkle with salt and pepper. Sprinkle the grated Parmesan cheese on top and then the shredded mozzarella cheese over the top. Bake in the preheated oven for 25 minutes, or until ravioli in the middle is softened and the cheese on top is golden brown. Prepare the veggies and salad. 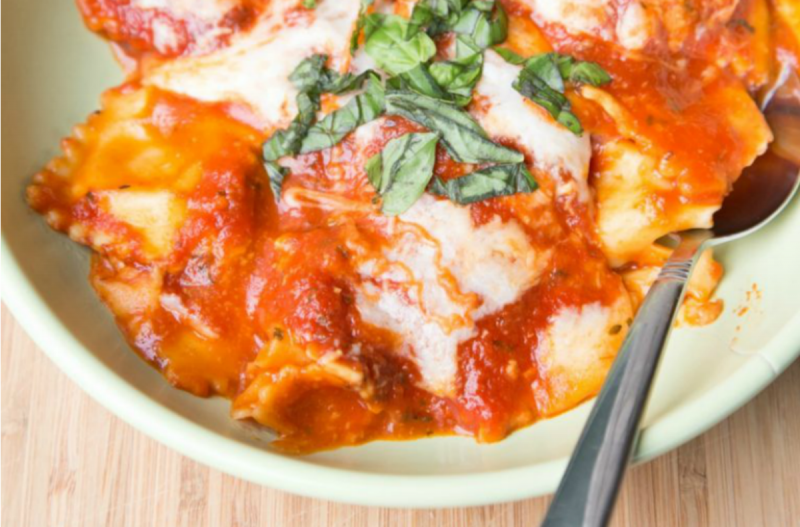 Serve Ravioli Bake with fresh basil garnish, veggies and salad. Do NOT add hot water to the freezer tray. Put tray in the freezer and freeze up to 6 months in fridge freezer or 12 months in a deep freezer. Thaw in the fridge overnight, or a warm bowl of water for about 20 minutes, before adding the HOT water, and transferring to the oven and baking as directed. Thaw, add 1 cup of warm water into the baking dish, around the ravioli, and bake at 350 F for 25 minutes, or until ravioli is cooked and cheese is golden brown. Serve with veggies and salad.